Thanks to everyone who came out- Folks came from Laurel all the way to Hunsaker with tons of delicious food! The BBQ’s were fired up, kids, dogs, and neighbors all had an opportunity to meet each other, swap stories and information. Extra Special thanks goes to Lennie Rae Cooke (Fire Mountain’s resident environmental guru) for organizing the event. ARE YOU AN ARTIST? WOULD YOU LIKE AN OPPORTUNITY TO SHOW AND SELL YOUR ART? The third annual Friends of Fire Mountain (FOFM) Art Show and Sale will be held on Saturday October 30th and we have space for a few more artists to participate. Whether you work in oils, acrylics, watercolor, encaustics, ceramics, wood carving, or multimedia collage, we would love to hear from you. Here is the chance you’ve been waiting for. If you are interested, contact Barry Robson at robsons2@cox.net or phone him at (760) 231-5305. He will set up a meeting, review your work and explain the details. There is no charge to participate, however we would like each artist to donate an item for an Art Raffle, and also donate 10% of their sales to charity. to grow anywhere on or in the body. There is currently no cure for NF. 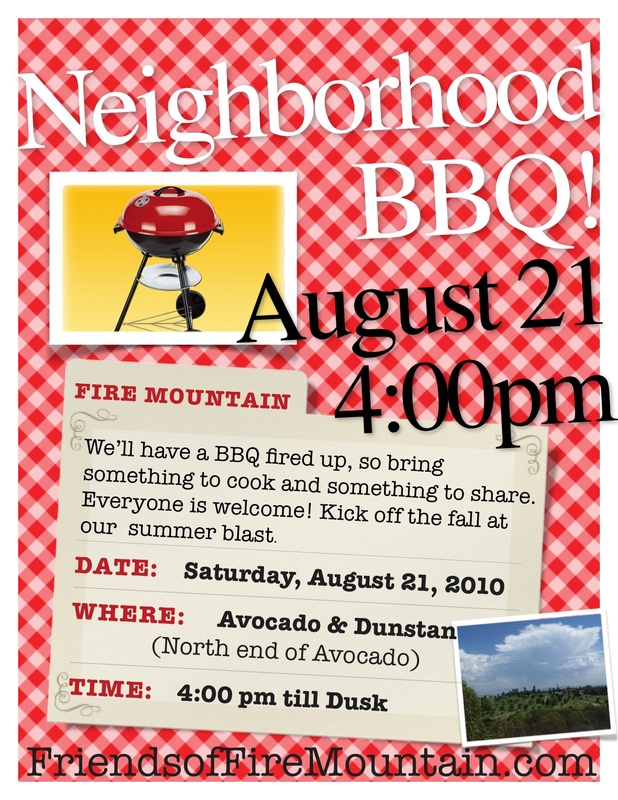 Neighborhood BBQ- Saturday, August 21- 4 p.m.
Come meet your neighbors at the Friends of Fire Mountain end of summer BBQ, Saturday, August 21, 2010 at 4:00 p.m.
We will have the grill fired up- you just bring something to put on it, plus something to share. Everyone is invited, so bring the kids, the neighbors, and the furry friends too (as long as they are friendly!). See you at the cul-de-sac at the end of Avocado Rd. on Dunstan around 4:00 p.m. until dusk. Feel free to send the flyer to your other neighborhood friends or post it in front of your house – spread the word- the more the merrier! Meet the artists in our neighborhood! The Friends of Fire Mountain invite you to see what the artists in our neighborhood are up to. Come to see paintings, wood carving, ceramics, jewelry, silk scarves and purses, encaustics, handmade cards and multimedia collage works. Enjoy complimentary coffee in the morning and wine in the afternoon—start your Christmas shopping early! *Childrens Tumor Foundation is dedicated to improving the health and wellbeing of individuals and families affected by Neurofibromatosis (NF) a genetic disorder that causes tumors to grow anywhere on or in the body. There is currently no cure for NF.